A savory mix of Salted Virginia Peanuts, Salted Jumbo Cashews, lightly seasoned Cheddar Sesame Sticks, roasted Pepitas (pumpkin seeds),and U.S. Fancy Salted Almonds. Mix & match our mixes and send your own signature gift this season. 18 oz vacuum tin. Roasted Salted Peanuts (Peanuts, Certified Non-GMO Expeller Pressed Soybean Oil, and Salt), Cheddar Sesame Sticks (Unbleached Wheat Flour (contains Malted Barley Flour as a natural enzyme additive), Soybean Oil, Ground Bulgur Wheat, Sesame Seeds, Cheese Powder (Cheddar Cheese (cultured Milk, Salt, Enzymes), Whey Protein Concentrate, Lactose, Buttermilk Solids, Salt, Natural Flavor, Annatto Extract), Salt, Annatto (Color), Citric Acid), Garlic Sesame Stick (Unbleached Wheat Flour (contains malted barley flour as an enzyme additive), Soybean Oil, Sesame Seeds, Bulgur Wheat, Salt, Garlic Powder, Beet Powder (color), Turmeric (color)), Roasted Salted Almonds (Almonds, Salt, Peanut and Vegetable Oil (Soybean)), Roasted Salted Cashews (Cashews, Salt, Peanut and Vegetable Oil (Soybean)), Roasted Salted Pepitas (Pepitas, Salt, Peanut and Vegetable Oil (Soybean)), Roasted Salted Sunflower Seeds (Sunflower Seeds, Salt, Peanut and Vegetable Oil (Soybean)).Manufactured on Equipment that also Processes Peanuts, Tree Nuts, Soybean, Wheat and Milk Products. Contains: Peanuts, Cashews, Almonds, Pepitas, Soy, Wheat, Milk. The tailgate mix is great. It's my husband's favorite! This snack mix was originally given to me as a gift. I loved it! I had to order it immediately. A wonderful mix that goes quickly in my house. Perfectly balanced and so tasty. The tailgate snack mix is really great. It's a good, tasty combination of nuts and seeds. We will definitely be ordering this again! My husband wants it by the case. Best Nuts and snacks EVER! 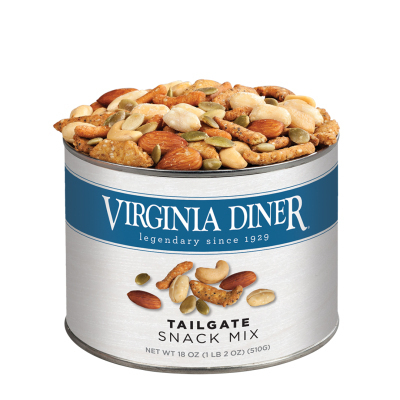 We all LOVED the Tailgate mix, and the kids loved the nuts with their college labels - William& Mary, Clemson, West VA, even Christopher Newport! The tailgate snack mix was yummy. The right amount of spice and mixture of nuts. I just wish I bought a bigger size. Excellent variety and flavor in this snack mix. This Tailgate Mix has a great mixture of ingredients. Great for snacking, but also great on salads! This is my husband's absolute favorite! He always wants to know when I'm going to order it again as a large tin only lasts him a few days. Really excellent for snacking or for parties. You will not be able to stop eating these! They are so freaking good! The only minor complaint is I wish the smaller (pepitas) would not all fall to the bottom. Just flip the can over often to mix them up. My order was a gift to my brother. The gift arrived promptly and in great shape. He loved everything I chose in the order.Your nuts and snacks are outstanding. Your website is easy to use, customer service is very helpful and special discounts are aways great. I wish I could get you PB shipped and I hear the PB pie is fantastic. The Tailgate Mix is awesome! Great nuts and really crunchy cheese snacks! Great mix for the holidays! my first time trying the snack mix. A bit heavy on the sesame sticks but otherwise very good. The peanut turtledoves have always been fantastic candy, for many, many years. My orders arrived before Christmas! Everyone was happy to receive their gift from Virginia Diner! The Virginia Diner on line site is user friendly. It is one the easiest sites through which to navigate. I have ordered from you many times and every order has been great. I tell other people about your site and hope they use your site. Keep doing the great job. Trail mix is great tasty snack when watching football. On a First Name Basis! Considering I seem to order a couple times a month, I'm pretty sure the Virginia Diner employees recognize my name! LOVE the tailgate mix. It's a perfect combo of ingredients. Always super fresh and very timely delivery. 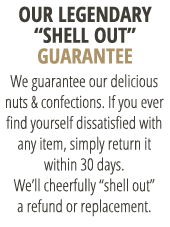 And do yourself a favor and check out their line of chocolates before they stop shipping in April! Heavenly!! !